What is the TPP and why do we care about it? 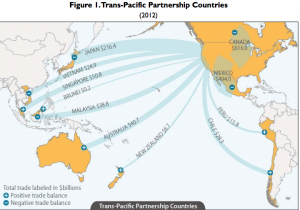 Quick look: Just what is the TPP and how does it impact global health? In recent weeks, there has been a lot of news coverage about the TPP, or the Trans-Pacific Partnership – both on the extensive negotiations that have taken place over the past several years as well as the growing opposition to the trade deal and how it would affect the quality of life of people around the world. But just what is the TPP, and why do we care about it? In short, the Trans-Pacific Partnership is a trade deal among 12 countries, including the United States. The negotiations have been held in secret, so little is known about the specific terms in the agreement, but WikiLeaks has published two leaked chapters detailing regulations concerning intellectual property and the environment. The potential detrimental effects on equity including the distribution of income, prominent determinants of health. Intellectual property laws that would set up barriers to accessing generic medicines and other health commodities (including AIDS drugs). Restrictions on individual countries’ abilities to pass and enforce laws protecting public health (such as regulating tobacco and the labeling thereof). The TPP is far from a done deal. Many progressive groups are joining together to oppose the TPP as well as the fast track authority that would enable the president to sign on to treaties without prior congressional approval. HAI’s own Senior MCH Advisor Mary Anne Mercer spoke at a recent activist rally in Seattle on January 31st about public health concerns related to the TPP.